Little Elsie is a 7-8 month old staffordshire terrier mix puppy. She came to the shelter as a stray. 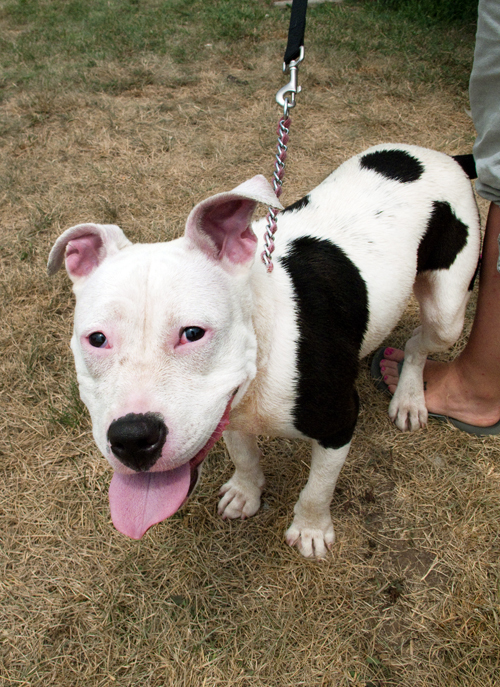 She is a petite bouncy affectionate girl who loves to go for leash walks and splash in the kiddie pool. Our volunteers named her "Elsie" because of her cow markings. Elsie is just learning to obey commands and likes to give squeaky barks when she doesn't get to play with other dogs, but she is a smart girl and a fast learner. Come meet this adorable pup before someone else snatches her up! If you are interested in learning more about Elsie or fostering/adopting her, please contact us or fill out an adoption application online!